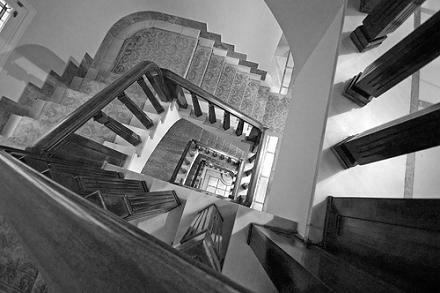 "It is possible to undergo a profound crisis involving non-ordinary experiences and to perceive it as pathological or psychiatric when, in fact, it may be more accurately and beneficially defined as a spiritual emergency." - Stanislav Grof; quote found here. 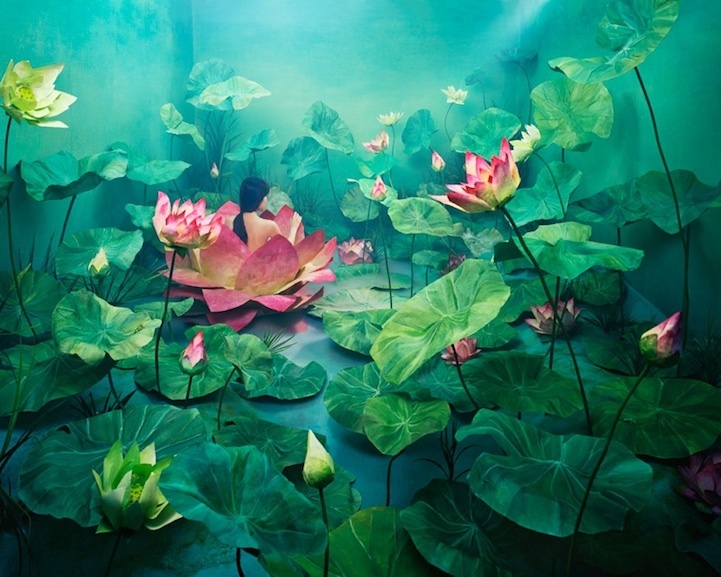 Gif Source: Lân Phạm Hoàng. For today, here is a beautiful clip of animation from the Japanese 2013 film, Kotonoha no Niwa (言の葉の庭; The Garden of Words), with birds flying across a city sky through clearing skies after a rain storm. The film is directed by Gen Xer Makoto Shinkai. The Delhi Purple Sapphire, in an arcane setting designed by one of its owners to contain its maleficent power with binding spells. 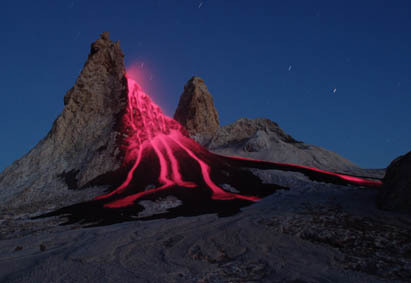 Image Source: Live Science. Today's Countdown to Hallowe'en post is about a curse of imperial plunder. 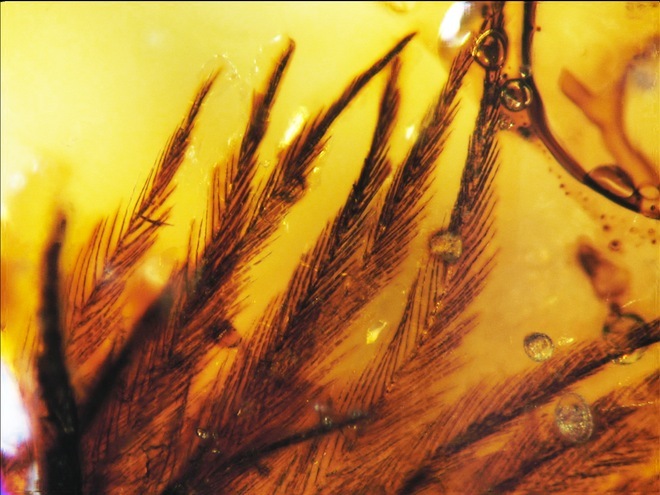 Above, a gemstone with a reputation for leaving disaster in its wake. 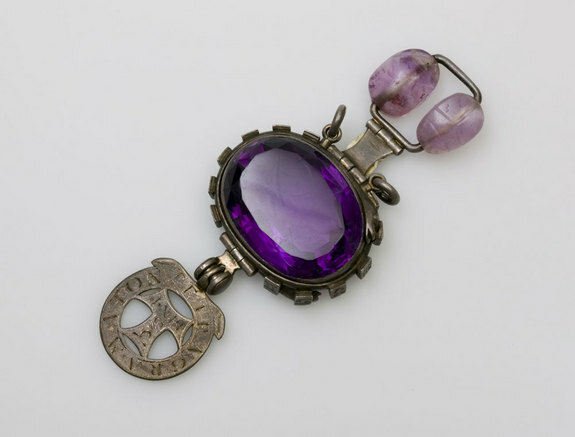 The gem is in fact an amethyst, stolen by a British soldier from a Temple of Indra - Hindu god of rain and thunderstorms - around the time of the 1857 Indian Mutiny. 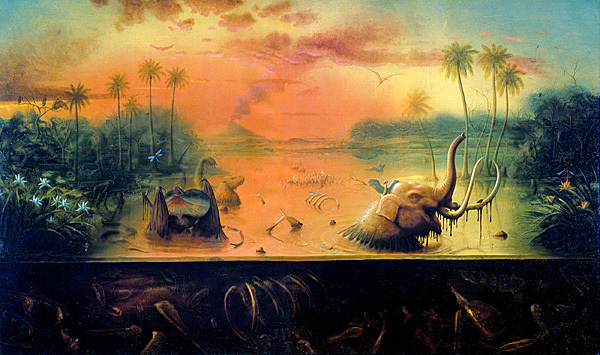 The current owner, the Natural History Museum in London, claims that it was stolen in 1855. From Kanpur, India, the stone made its way to Britain in the hands of Bengal cavalryman, Colonel W. Ferris. According to Live Science and The Indian Express, the gem spread misery to all who possessed it. Just in case you needed a pick-me-up, see the video of the day below the jump: from the perspective of an eagle in flight in the French Alps, Chamonix, Mer De Glace area. 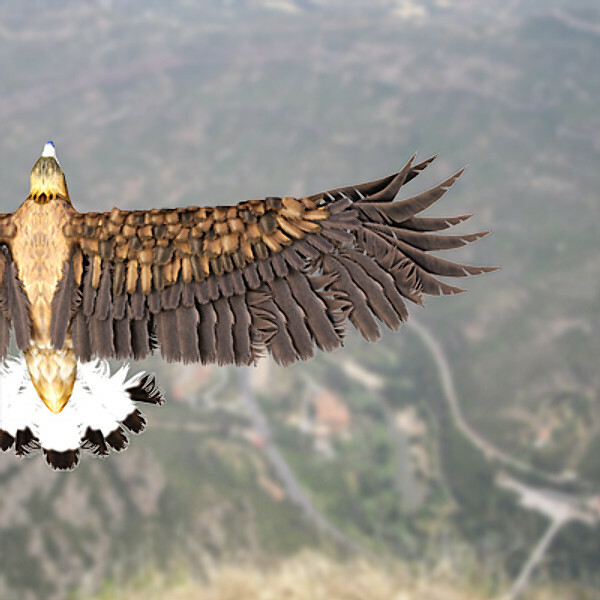 Is it a real camera strapped to an eagle's back, and not a simulation? I certainly hope so (Hat tip: Joseph De Palma). 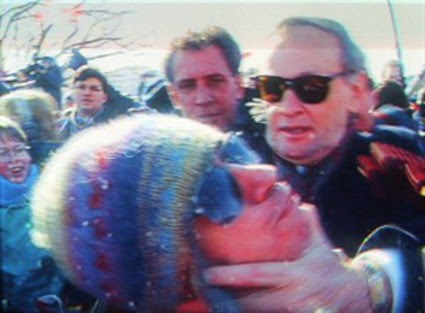 Prime Minister Chrétien choking a protester in 1996 in what became known as the Shawinigan Handshake, named after Chrétien's home town. Image Source: Ugly Hockey Sweater. Today is Canada Day. I ran across a dumb video of a parrot singing the national anthem. But the result was just disturbing. I tried to find something happy, but the first thing that came up was former PM Chrétien strangling a protest in a famous encounter from 1996 (above). The photo recalls recent Canadian news, which lately has been awful. Large sections of Calgary and other Alberta communities were washed out last week by apocalyptic floods. You can see footage of Calgary's flooded downtown centre below the jump. There is another story about a teenager working in a grocery store on the South Shore of the city who was forbidden from talking in English, even to Anglo customers who asked her questions in English on the store floor; she was also prohibited from speaking English to fellow Anglo co-workers while working with them or during work breaks. An Anglo political counter-movement is starting to gain momentum, and some of its proponents are not much better than the people they are criticizing. An unreleased video of the mayor of Toronto, Rob Ford, purportedly shows him smoking crack. After Gawker leaked the story, Ford's popularity jumped. The case is getting more convoluted, and now involves a loosely connected murder trial. 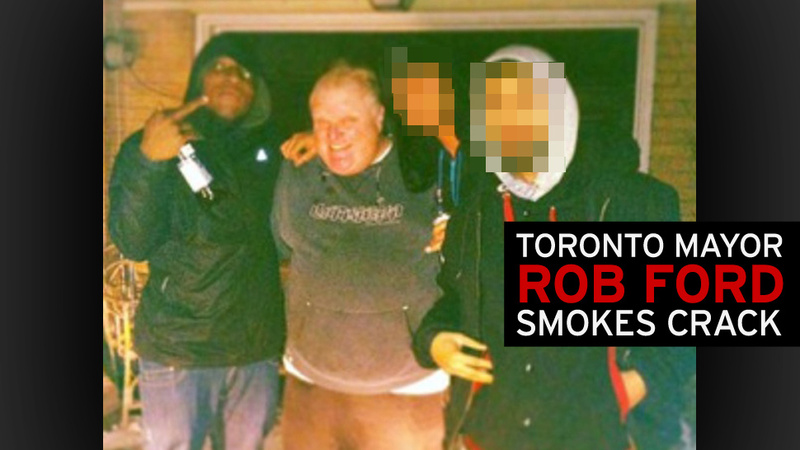 News of a video of Toronto mayor Rob Ford smoking crack was recently leaked. His popularity rose after the scandal, which is still unfolding. Image Source: Gawker. 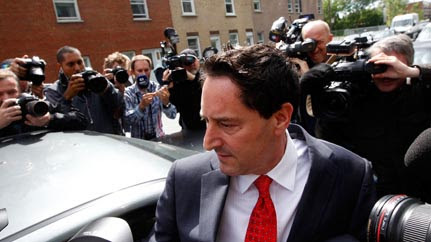 Montreal's interim mayor Michael Applebaum resigned amid corruption allegations in June 2013. Image Source: Sun News. 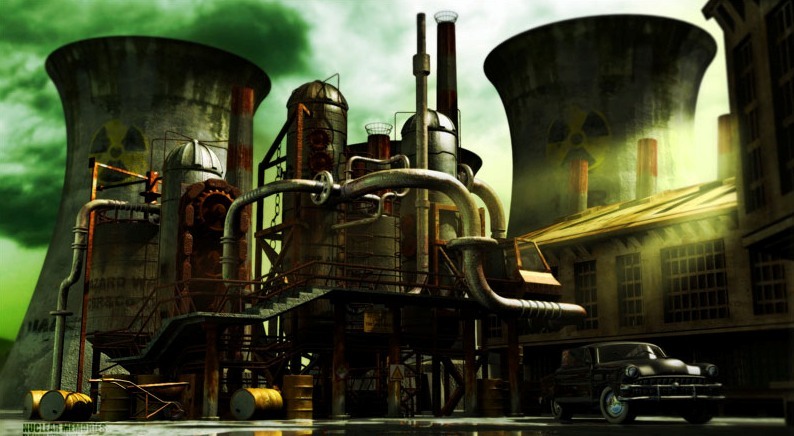 Today, the Countdown to Hallowe'en blogathon continues with a spooky post on the environment, a topic I normally cover here. All Hallows' Eve overemphasizes the supernatural: it is a Christian night of purgatorial observance, coming before All Saints' Day (November 1) and All Souls' Day (November 2). 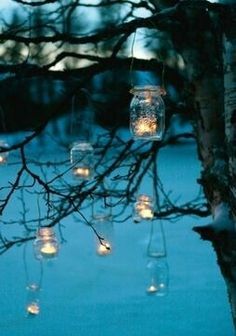 But Hallowe'en is also a celebration of the power of the purely natural world, because it incorporates pagan elements, pre-Christian traditions around the harvest, and northern autumnal festivals. These latter aspects draw from the Roman feast of Pomona; the Celtic festival of Samhain; the Welsh Nos Galan Gaeaf; and the German Martinisingen. Below the jump, some unsettling calls from birds and animals (some are speculative). Millennial Mysteries: The Answer to Arctic Owls Flying South and Other 2012 Arctic Bird Oddities? 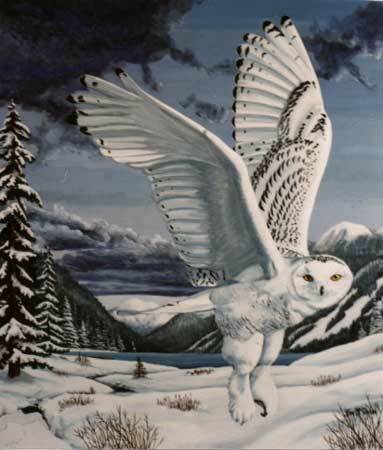 Painting of Snowy Owl (1996) © Kim Hunter. A once-in-a-lifetime sight: "The Missouri Department of Conservation said no one has seen a snowy owl this far south since 1974." 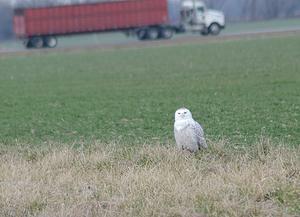 A Snowy Owl in northern Jasper County, Missouri, January 2012. 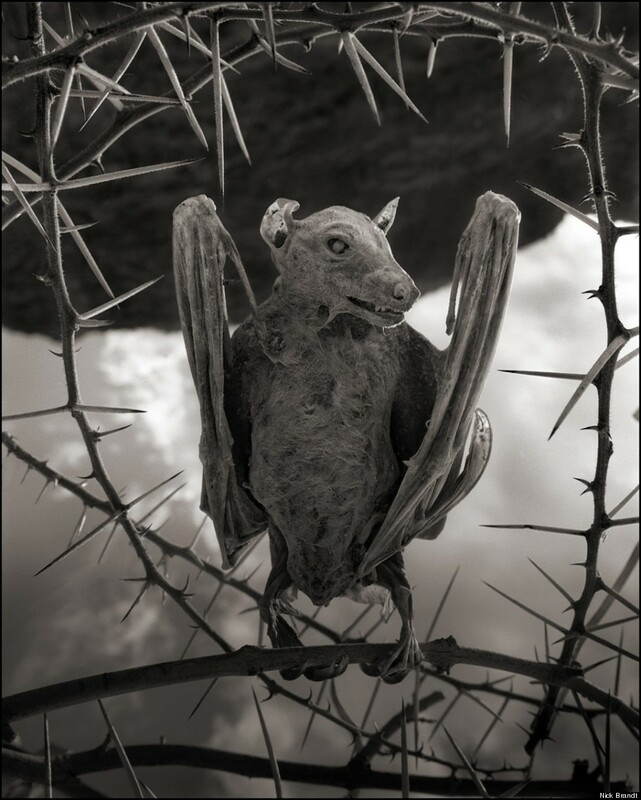 Image Source: Carthage Press. "What we're seeing now -- it's unbelievable," said Denver Holt, head of the Owl Research Institute in Montana. Holt and other owl experts say the phenomenon is likely linked to lemmings, a rodent that accounts for 90 percent of the diet of snowy owls during breeding months that stretch from May into September. The largely nocturnal birds also prey on a host of other animals, from voles to geese. Research on the animals is scarce because of the remoteness and extreme conditions of the terrain the owls occupy, including northern Russia and Scandinavia, he said. The surge in snowy owl sightings has brought birders flocking from Texas, Arizona and Utah to the Northern Rockies and Pacific Northwest, pouring tourist dollars into local economies and crowding parks and wildlife areas. The irruption has triggered widespread public fascination that appears to span ages and interests. ... This winter's snowy owl outbreak, with multiple sightings as far south as Oklahoma, remains largely a mystery of nature. "There's a lot of speculation. As far as hard evidence, we really don't know," Holt said. For further reports on the Snowy Owls from MSM outlets and local bird-watching societies, go here, here, here, here, here, here, here, here, here and here. The Great Backyard Bird Count expects to record this irruption. The Bird Count is an annual event in which people across North America submit reports on the numbers and types of birds they see in their backyards. This information helps keep track of phenomena such as Arctic birds flying further south than usual. 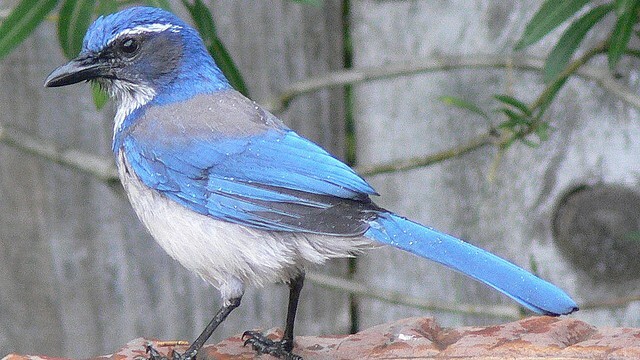 The Great Backyard Bird Count starts February 17 and runs until February 20 (to participate, go here). Last year, 11.5 million birds were counted by amateur bird-watchers in the Bird Count, which also runs a photo contest and gallery. Although this owl irruption is a really popular Internet story, no one has bothered to ask (at least, as far as I could see) whether other Arctic avian species which normally stay within a certain northern range are flying south as well. This is where this seemingly isolated event gets interesting. 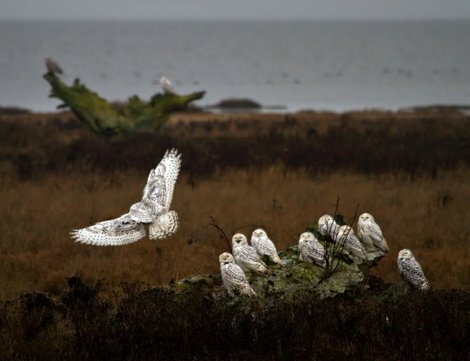 A parliament of Arctic Owls in British Columbia's Boundary Bay (7 January 2012) © Sandy Milliken. Image Source: via The Spokesman-Review. 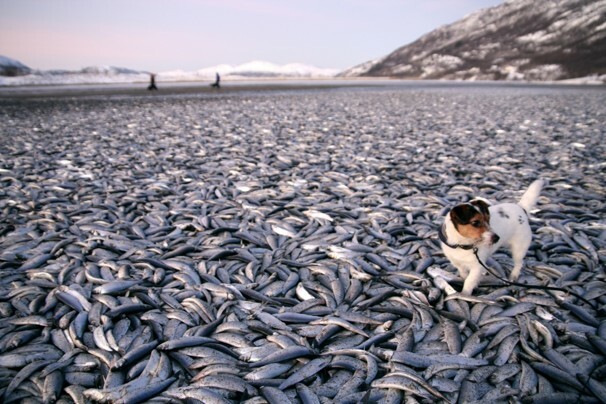 Caption for the above photograph: (Jan Petter Jørgensen / Scanpix / Norway/Associated Press) - In this image taken Saturday Dec. 31, 2011 Molly the dog walks amongst the dead herring on a beach at Kvaenes northern Norway. 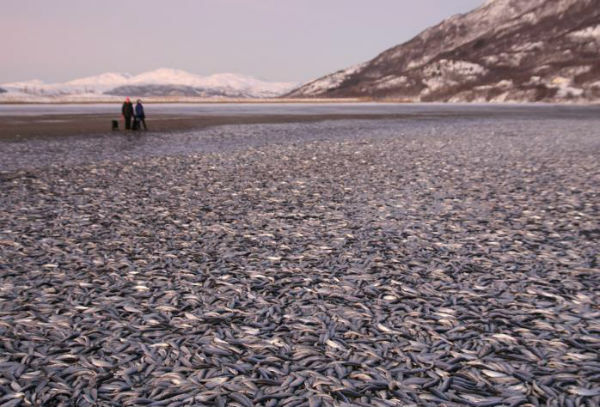 Norwegians were puzzled on New Year’s Eve, tens if not hundreds of thousands of dead herrings carpeted a coastal stretch in northern Norway. Here we are, ringing in the New Year with conspiracy theories, predictions about the end of the world, and dead animals, in this case thousands of dead fish in Norway which washed up on the beaches around Kvaenes on 31 December, and then disappeared (reports here, here, here, here). For two of my earlier posts on this subject from 2012 and 2011, click here and this post has a list of all such incidents from 2010 into mid 2011. 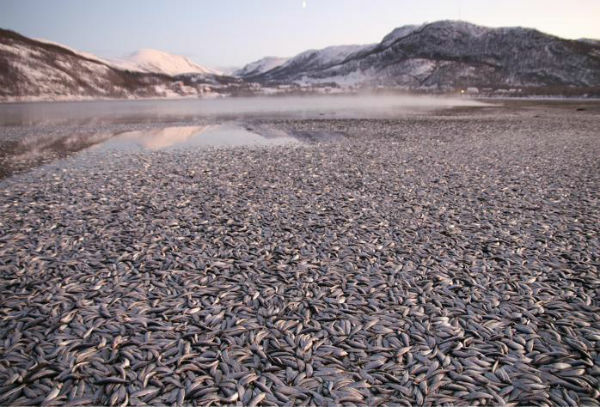 Thousands of dead herring at Kvaenes beach (Credit: Jan-Petter Jørgensen). 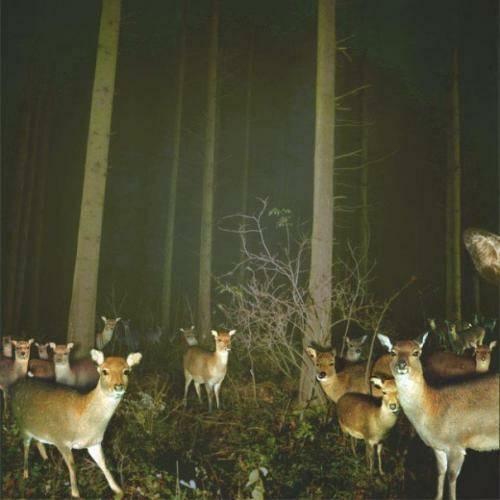 Image Source: The Watchers. Dead fish were spotted by people walking their dogs on New Year's morning (Credit: Jan-Petter Jørgensen). 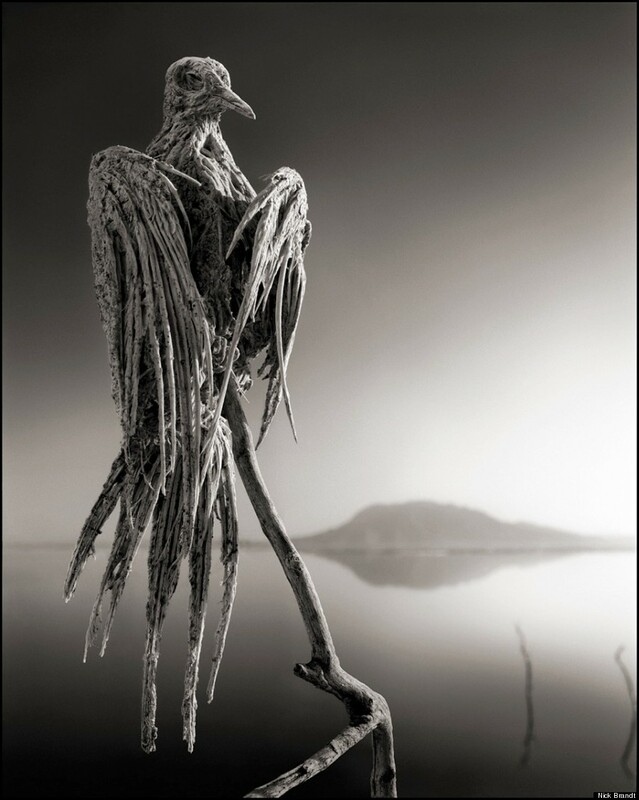 Image Source: The Watchers. Click to see all my posts on Millennial Mysteries. See all my posts on Millennial Omens. Bird kill reported in Arkansas, 1 January 2012. Image Source: AP via THV. Thousands of dead blackbirds rained down on a town in central Arkansas last New Year's Eve after revelers set off fireworks that spooked them from their roost, and officials were reporting a similar occurrence Saturday as 2012 approached. Police in Beebe said dozens of blackbirds had fallen dead, prompting officers to ban residents from shooting fireworks Saturday night. It wasn't immediately clear if fireworks were again to blame, but authorities weren't taking a chance. Officer John Weeks said the first reports of "birds on the streets" came around 7 p.m. as residents celebrated the year's end with fireworks in their neighborhoods. "We started shutting down fireworks," he said. 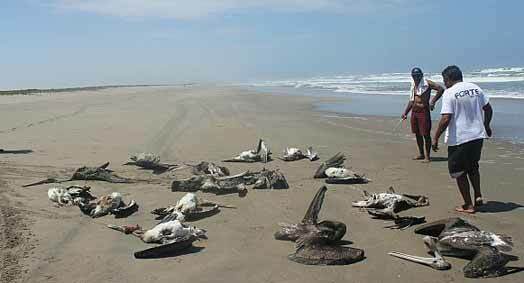 "We're working on cleaning up the birds now." He said police were working with animal control workers and others to remove the birds and determine a death count. "We're not sure if they're going to continue to fall throughout the night. I can't tell you," Weeks said. Scientists say the loud cracks and booms from celebratory fireworks likely sent the birds into such a tizzy that they crashed into homes, cars and each other before plummeting to their deaths last New Year's Eve. The birds landed on roofs, sidewalks, streets and fields. One struck a woman walking her dog. Another hit a police cruiser. The blackbird die-off, coupled with tens of thousands of dead drum fish that washed up on the shores of the Arkansas River, flung the state into the national headlines and drew conspiracy theorists and filmmakers to the town about 30 miles northeast of Little Rock that shares Arkansas Gov. Mike Beebe's last name. 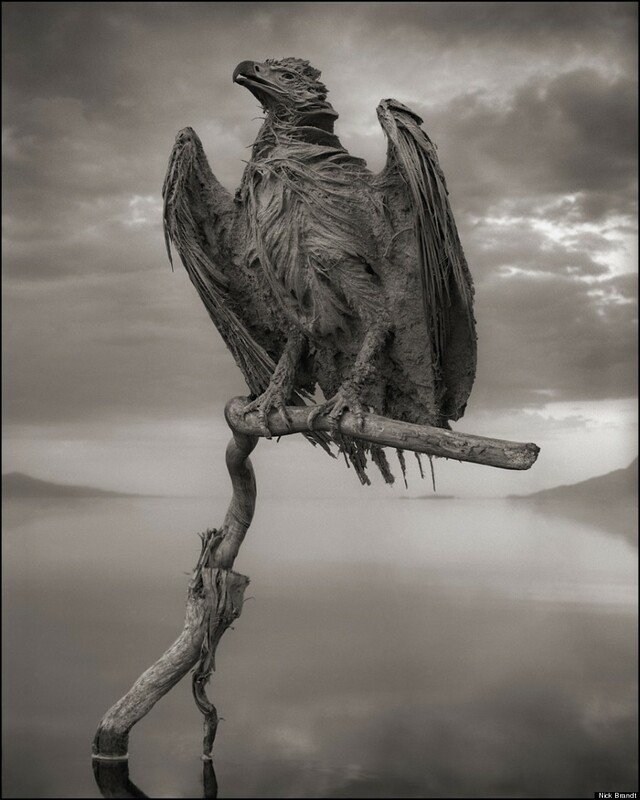 Some people speculated that the birds had been poisoned; others said their deaths marked the beginning of the apocalypse. 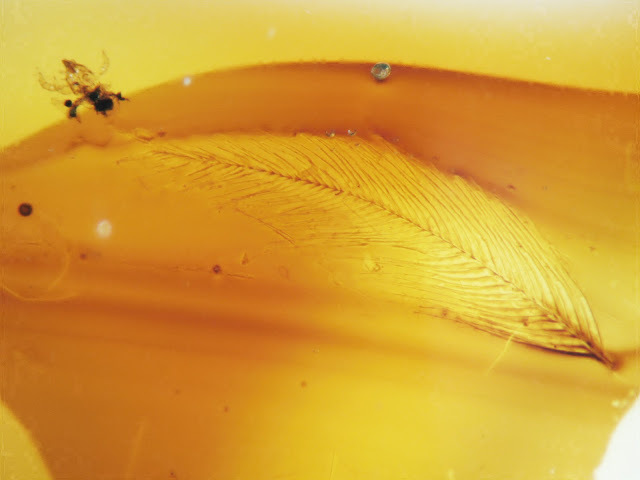 Wired recently reported that a bunch of dinosaur feathers have been found encased in Canadian amber, further confirming that the great reptiles actually looked like nightmarish giant birds. 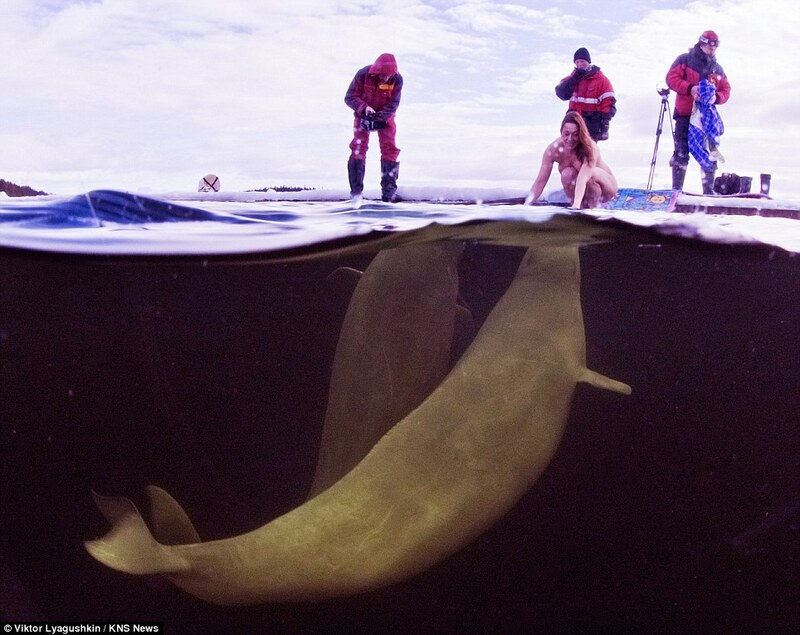 Naked Russian diver tames Beluga whales in Arctic waters. Um ... what? Image Source: Viktor Lyagushkin/KNS/I09. Some days, the news headlines give a straightforward snapshot of what is going on in the world. Some days, the mainstream media stories are curiously uninformative, strangely empty of content and meaning. On days like that, I appreciate Fox Mulder and Twilight Zone a little more. Offbeat Websites capture the current mood, if not the facts. And frankly, the mood's uneasy. Even more than usual, the Internet is positively humming with weirdness right now. 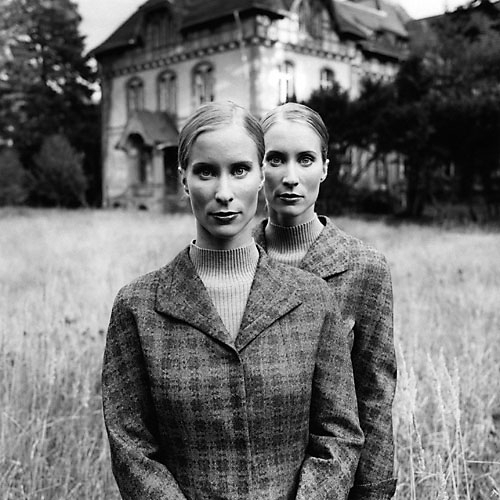 Weimar blog focusses on twins this week. Image Source: Andrej Glusgold via Weimar. Midsummer. 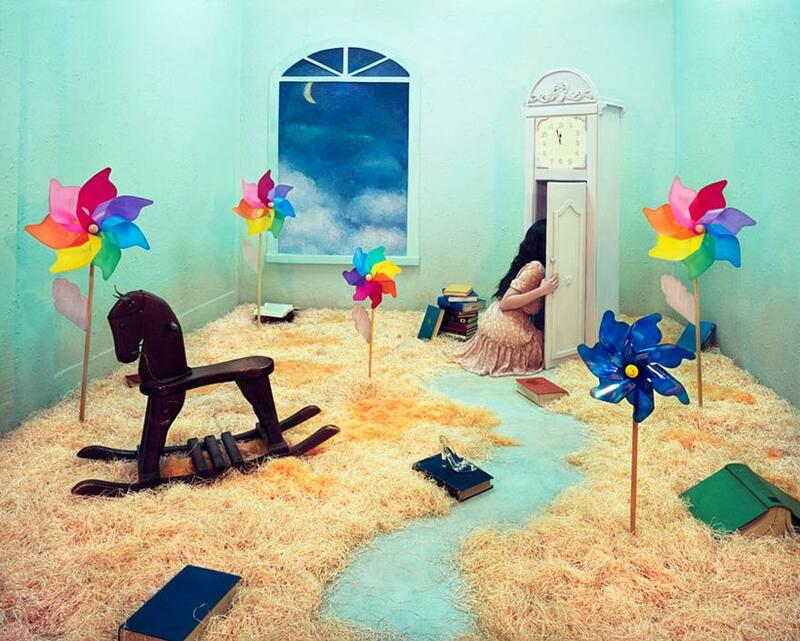 It should be a dreamy, beautiful time. But we're half way through a troubling year. 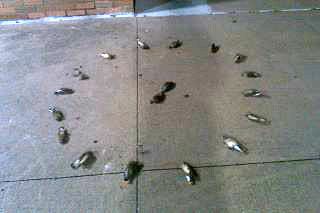 The year began with flocks of birds falling from the sky and fish dying in their millions (bizarre occurences are still happening). Then Japan had one of the worst earthquakes in her history; and the worst nuclear accident in global history resulted, about which the news is not improving. The death of Osama Bin Laden prompted an upswing in threats and conspiracy theories. Economists remain pessimistic about global economies. An Indian prophet died amid expectations of his resurrection. An Italian prophet predicted a terrible European earthquake. A California prophet proclaimed the end of the world now, no, this autumn - and then suffered a stroke. The Middle East has churned through its 'Arab Spring' to a violent stalemate. Astrologers are proclaiming that the heavens have turned upside down in a month intensified by three eclipses. A Chilean volcano exploded. And so on. 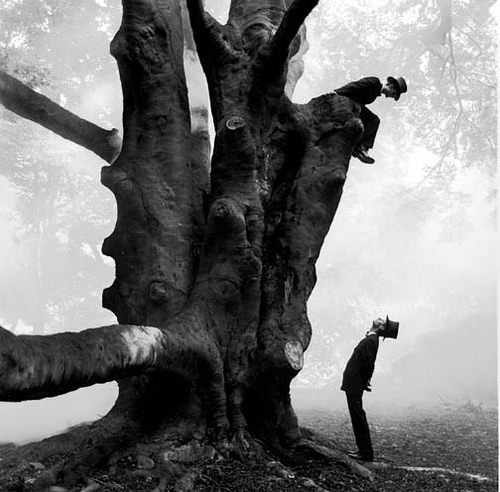 Image Source: Rodney Smith via Weimar. Image Source: David Byun via Weimar. True to the impulse toward Milliennial dualism, it feels like the ghostly mirror image of the second half of the year is manifesting opposite the first six months that have already transpired. The stage has been set, we're ready for Act II. Or is it Act III? An eerie expectation arises that there's a ethereal third dimension to this mirrored configuration. Image Source: Karl Hubbuch (1927) via Weimar.